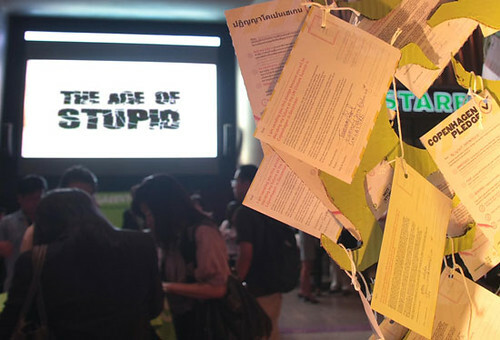 Yesterday night, as part of the Chang[e] Caravan, we hosted the premier screening of Age of Stupid in Bangkok. The movie is set in a bleak dystopian future because the leaders of today failed to act. Pete Postlethwaite as an old man living in the devastated world of 2055, watching 'archive' footage from 2008 and asking: why didn't we stop climate change while we had the chance? These were the words that reverberated in my mind in the darkness of the Cultural Center of the Philippines’ Tanghalang Manuel Conde. For the last few days at the Chang[e] Caravan, our eyes and ears have been partly focused on the special session on climate change during the UN General Assembly yesterday. 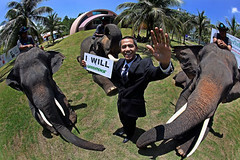 We’ve put out two stories about climate vulnerable communities that we and the elephants have visited here in the central plains of Thailand, still calling on world leaders, particularly US President Obama, to act. Isa (Wiriya) is our cheerfully tireless media officer in the Bangkok office. Here she’s going beyond duty to help distribute the brochures which contain the petition we’re running for the Chang[e] Caravan. The people we’ve met along the way have been all too happy to support our Caravan. We’ve passed houses, stores and establishments – communities – who have given us and the elephants water, corn, sugar cane, candies and juice, and a place to rest our weary feet. Meet Tui (Sataporn Thongma), our fantastic photographer. That’s him behind Jeeb holding the banner. You’d never guess, but Tui is also our IT guy here in the Greenpeace Bangkok office. Tui has been capturing all the beautiful moments from the Caravan and we’ll miss him when he has to return to Bangkok and go back being the techie…..